City on a Hill Press recently wrote about Norris Center student-artists Aly Rueda's and Juniper Harrower's US/Mexico Border Biodiversity project! Help support UCSC's first introductory mycology class. Click here to find our donation link and learn more about the instructor, renowned fungi forager and author, Christian Schwarz. The Alaska Wrangell Mountains Field Studies Program application is due (extended deadline)! Norris Center Open House for Alumni Weekend! All are welcome! Art workshop on painting California wildflowers with Maryjo Koch at the Norris Center. Register now! Are the pink salamanders of Fort Ord blending into the sand? Norris Center Student Award Winner Caitlyn Rich discusses her study on salamander coloration at Fort Ord. "Just as we perceive our commonality of purpose we grow more accepting of each other's diversity. The poet, the artist, the teacher, and the scientist become equal partners in our seeking." The Resurvey is underway! The Norris Center and the UCSC Natural Reserves are teaming up to study our changing planet. 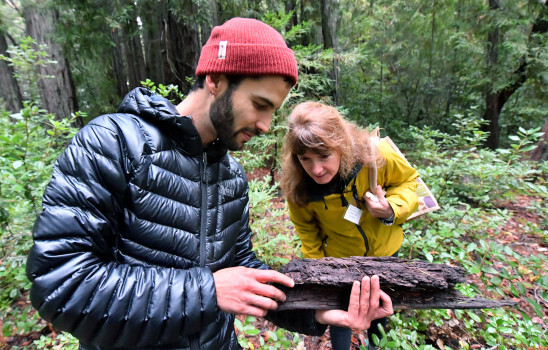 Starting with Younger Lagoon, teams of UCSC students will catalog every species - from bryophytes to birds - found at the UCSC Natural Reserves, and catalog them in the Norris Center. Learn how you can get involved with the survey here. Donate to the Norris Center!